Today is National Picnic Day, tomorrow is Father’s Day, so grab your family and friends and head over to the nearest park or beach to celebrate today! 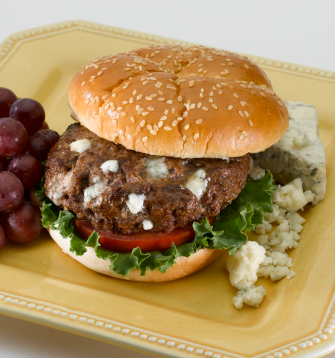 Make sure that enough food is packed, and if there is a grill at the park then here is a mouthwatering Blue Cheese Burger recipe. This recipe was given to me by my friend who used to work at a restaurant, and was always playing around with new hamburger recipes. 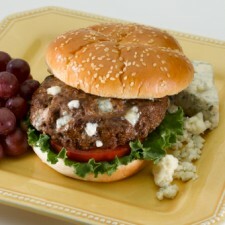 This recipe makes 4 Blue Cheese Burgers, and is great with lettuce, tomato, and mayonnaise. Mix the ground beef, mustard, garlic, onions, blue cheese, water, and egg in a large bowl with your hands. Shape into patties that are ½ inch thick, and larger than your bun. Dip a paper towel in coconut oil, and use tongs to make sure the grill is well oiled before laying down the patties. Season patties with salt and pepper, and place on grill for about 5 minutes per side. Do not press down on the burgers. If you don’t want to mix the blue cheese into the burger patties, you can also top the burger with the blue cheese towards the end of grilling. My friend would put vegetable oil on the grill before he cooked the burgers, but I think it tastes much better with Kelapo Coconut Oil. Some other great food items you might want to bring on your picnic include Beef Jerky, Fruit Salad with Coconut Cream, Snickerdoodles, or a Healthy Wrap! *Don’t forget to come back tomorrow for tips on how to make your dad’s Father’s Day extra special!